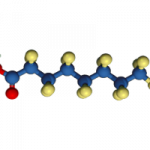 Can I protect my pontoons with Alumetron during the winter? My neighbor pulled his 6 year old pontoon boat over the weekend and his pontoons looked brand new and he hardly had any growth on the bottom. What he had just wiped off. I’ve been scrubbing for 2 days now and still can’t get my toons clean. He said he used your products to get his clean and then put Alumetron and VS721 on them. I want to do the same. I’m really fed up with all this scrubbing and my pontoons still look dull and stained. My question is can I put the Alumetron and VS721 on now or should I wait for the spring. I got most of the algae and stuff off the bottom, except under the bunks and I want to make them bright and shiny again. How do I do that? Also, how long does it last? 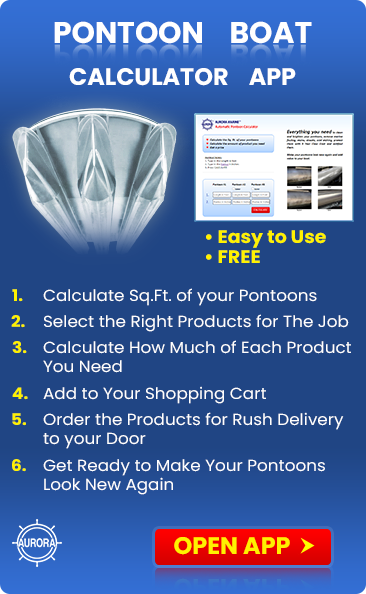 Yes, fall and winter is an excellent time to brighten, restore and protect your pontoons. That way you’ll be ready to launch in the spring, rather than rushing around trying to get everything done to get your boat ready. 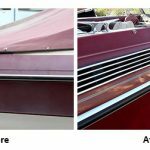 A lot of dealers are now offering to restore and protect their customer’s boats with Alumetron. First you need to get the rest of the marine growth off your pontoons. 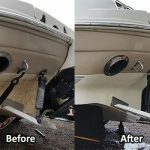 (See Getting Under the Trailer Bunks to Clean the Boat Bottom / Bottom Cleaning & Protecting / Ask the Skipper for instructions on how to lift your boat off the trailer). Use Algex to clean the growth off. No scrubbing. Just spray it on, wait ½ hour and rinse clean. 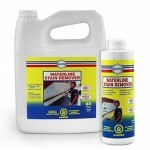 Next brighten the pontoons by spraying Alumabrite on the pontoons and rinsing clean. This will take about 5 to 10 minutes per pontoon. 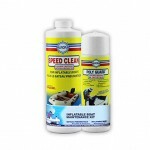 After you need to wash and degrease the aluminum with Boat Clean Plus, rinse and allow to dry. 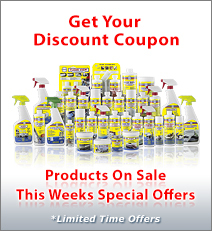 You can now wipe on 2 or 3 coats of Alumetron and let cure for a few days. The last step is applying one coat of VS721 below the waterline and wiping off the haze. Shouldn’t take you more than an hour or so. 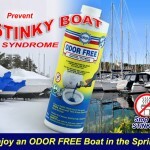 This will protect your pontoons against oxidation and staining over the winter. Before you launch, put on a 2nd coat of VS721 and you’re ready to launch. You will need to wash the bottom every fall and reapply 2 coats of VS721 every year but the Alumetron should last you 5 years or more.